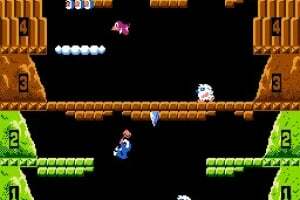 Conquer treacherous mountain peaks, leap across icy chasms and swat snow-dwelling beasts – solo or with a friend – in this NES classic from 1984. 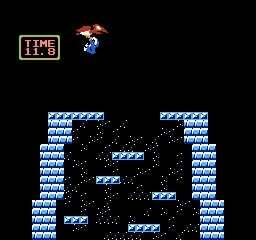 Use your hammer to bash blocks from below and to defend yourself from the wildlife as you jump from floor to floor towards the summit. 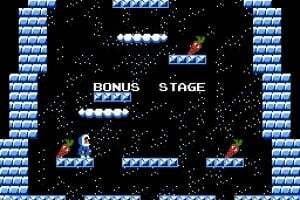 Make it through all eight floors to reach the Bonus Stage and grab as many vegetables as you can before hitching a lift on a friendly condor. In two player mode, either work together to reach the mountain-top or compete to see who can get the glory first! 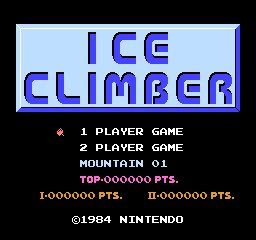 This is easily one of the best two-player/co-op games on NES. I still play it with friends from time to time. And the music is a classic. 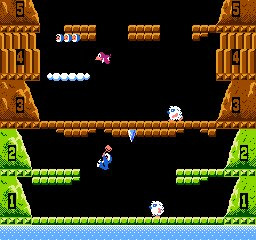 I loved this game sooooo much as a kid. I hated the way they jumped such a short distance but I couldn't stop laughing in multiplayer! Oh man, and once you get the controls down it's a blast to scroll your friends off the screen! hahaha The only regret I have is the horrible free-play arcade setup. You can go to any level at any time so there's really nothing to expand on. The levels were so similar to one another there's just so little to keep one's interest. I'd have to say co-op only on this one. This game is a all time favotite of mine I could play it for hours getting some fun out of it with my friends. I reccomend this game to everyone it is a classic. i have it on gba and now vc console! yeah! 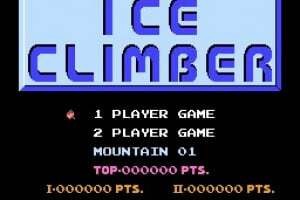 If you'd play all the 32 levels from the beginning I doubt anyone could beat this game. I think it was a good idea to have a level selection right from the start. So you can hop in where you left or drowned. Again, the fun multiplies if you have comrades to play with. 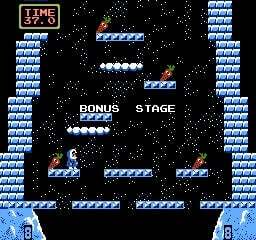 But also one player will have a good challenge for beating all 32 stages. This game's good. The gameplay is simple. condor! Sounds simple, but can you do it in 32 mountains? The person playing in the video isn't every good :S Good game though, theres not that much to do in it apart from jump around levels. I just love the game. Its not that easy, so you can play it quite long before mastering it. Music is quite hypnotic. Characters are funny. We good game. A fun and challenging game, two player is a must. The first few minutes I started playing, I wasn't sure if it was that good, then after getting used to the way it plays, it's acctually a very good game, and in some ways quite advanced for it's day. 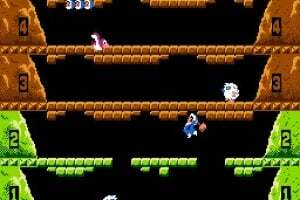 Such as having 32 levels to chose from on the tittle screen, so you can always start off from the last level you were at. Simple, challenging, and engaging. I now understand why they included them in the Smash Bros. series. 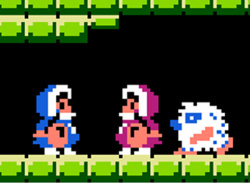 The Ice Climbers deserve more kudos. I'm sorry but this game blows. The jumping is inconsistant, the game is censored so you can't club the seals, and there is no ending to the game either. The cover for this game is just hilarious! 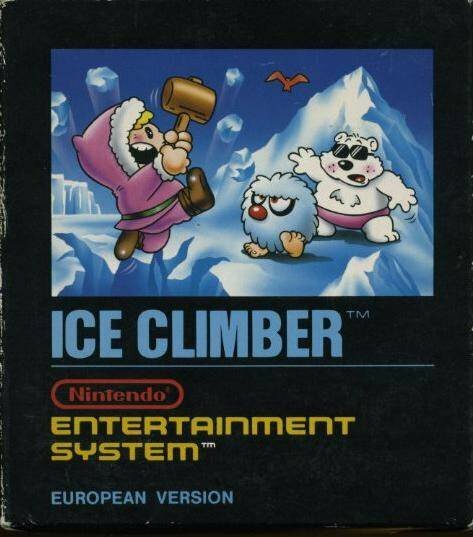 You could never release a game these days that had an Eskimo about to club a polar bear on the front. I downloaded this for a friend who loves it but didn't have a Wii at the time. I'd play it when he came over, and it was moderately fun. Jumping blows. He has his own Wii now, and we play it at his place. Mine is on my SD card. I hope I can get this on Animal Crossing soon... anyone who can give me the password on Animal Crossing or send it to me on Animal Crossing will be thanked somehow (hopefully!). PM me on vcforums or Nsider2 if you're feeling nice. I accidentally downloaded this (don't absentmindedly browse the VC store while on the phone) but since I used to like it, it's OK. The main problem is the stiff controls. After playing the trial version on Brawl, I would have to give this one a miss. Why? 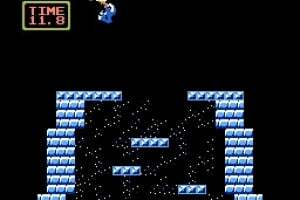 I really don't like the way the ice climbers jump. You woudn't know if you reached the platform or not. Im collecting all of the classics, but I didnt like it much when I pplayed it on SSBB. One of my favorite games. Better when played with a friend, but solo is still very fun. I didn't like how you jump, but I got used to it. One of the best NES games. A must have, if your a retro gamer. This game is alright. 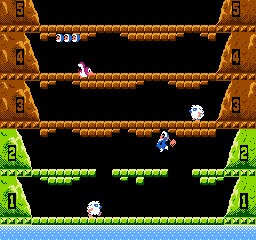 I still have this game in e-card form, and it's pretty fun, but the problematic jumping makes it frustrating especially in the later levels. 3 stars for me. I bought this game the day it was released for the NES and I've loved it ever since. The control is tricky, but once you get it down, this game becomes surprisingly addictive. I tried the demo on SSBB, but didn't understand it. OMG. We are getting this along with our 10 free Ambassador Games and I am so excited ;D Can't wait to play it on the go again like I did when i had it as a "NES Classic" cartridge on my GBA I really think it's high time for a follow up to this. Yes, a sequel. 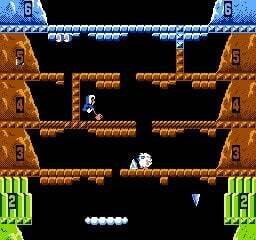 But it could be more of a platformer with some of the same enemies as level bosses, what do the rest of you think? @Corbs totally agree with u Great piece of my childhood as well as a great game today! 5/10 is way too low for the review score. It should be 9/10! 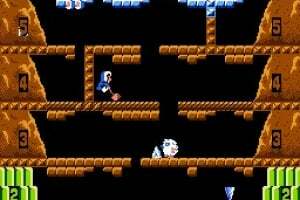 Video What Would Ice Climber Look Like If It Was Recreated In Unreal Engine 4?